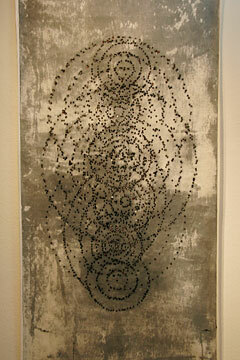 "Palimpsest I," a monoprint on Japanese paper, looks as though holes are burnt through the paper. But it's an illusion. When Nehmad burns impressions into the woodblock plates, the burn goes so deep that ink applied to the plate only takes to the outline of the impression -- and give the illusion of a hole. AFTER an injury that left her in debilitating pain, artist and former lawyer Deborah Nehmad quit practicing law and put her energy into creating art. 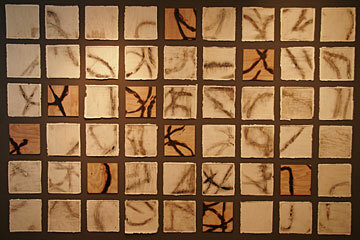 Nehmad's works in "Iterations" are all about her experience of pain. David Behlke, director of the Koa Gallery, where "Iterations" runs through Nov. 9, says the process of making art is now a "daily meditation" for Nehmad, who still copes with constant pain. "The end result is the goal, but how she gets there is what Deborah enjoys most," Behlke says. Nehmad employs pyrography to create burn marks of numbers on woodblock plates, which then bear ash and are pressed onto another material. The resulting numerical ash transfers refer to Nehmad's levels of pain. "Think of cremation, the burning of one's past, burning the bridges behind us," Behlke says. "Her works are all about process." Koa Gallery is located on the Kapiolani Community College campus, at 4303 Diamond Head Road. Gallery hours are 10 a.m. to 4 p.m. Mondays to Fridays and 10 a.m. to 2 p.m. Saturdays. Call 734-9374. 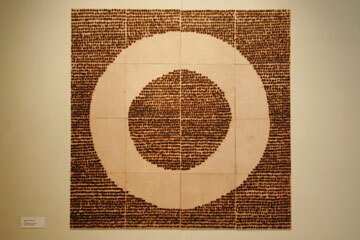 "4 x 4," a pyrography on wood, is part of Deborah Nehmad's exhibit "Iterations," showing at Koa Gallery. The "6 x 9" installation, which is made of wood and paper.